Khabib Nurmagomedov kept things civil during the World Cup. The beef between Nurmagomedov and McGregor has been brewing. During the week of UFC 223, Nurmagomedov and his team confronted Artem Lobov in a hotel lobby in New York City for comments he had made regarding “The Eagle.” McGregor retaliated by attacking a fighter bus holding Nurmagomedov, shattering a glass window in the process. The incident caused a cut to Michael Chiesa, removing him from the card. McGregor was arrested and released on bail. He’s working on a plea deal to lessen his punishment. Chiesa is also working towards suing McGregor. Nurmagomedov would go on to win the UFC lightweight title at UFC 223. 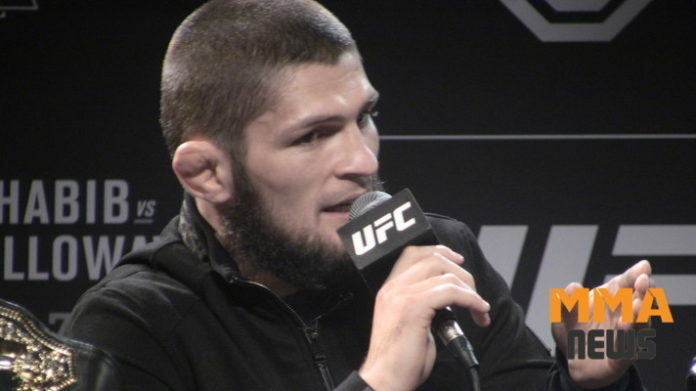 After the bout, Nurmagomedov said he’d fight McGregor in or out of the Octagon. Fans were on their toes following word that “The Eagle” and the “Notorious” one were in Russia for the World Cup. Nurmagomedov’s ideal opponent for his next title defense is McGregor, but he’s made it clear that a bout with Georges St-Pierre interests him. If neither man is available, then “The Eagle” will keep a close eye on the winner of Eddie Alvarez vs. Dustin Poirier. Do you think Khabib Nurmagomedov’s next fight will be against Conor McGregor?